Does that even make sense? I don’t know. But I’m running out of times of day. And moon phases. Waning Gibbous on Twilight didn’t sound so good. Anyway, the MTV Movie Award nominations were announced yesterday. Mega Twi-Hard anxiety ensued because Twilight, which has dominated this event for the last few years, only received one nomination… and not even the most important one: Best Kiss. Instead, Taylor Lautner’s chest is representing the entire franchise in the Best Shirtless category. Here’s what’s great about the MTV Movie Awards. They’re meaningless, but they know it. It’s a popularity contest that doesn’t pretend to be anything other than a popularity contest, unlike the Oscars, a popularity contest masquerading like it isn’t. This transparency allows the MTV Awards to openly and shamelessly court attendance and ratings. Which is why Twilight has been featured so heavily since the phenomenon took over. And the prospect of a Notebook-ish kiss between Kristen Stewart and Robert Pattinson on stage has been the main attraction. And now it’s not to be. Is it not to be because MTV chose NOT to bring it back? Is MTV over Twilight? I don’t think MTV is over Twilight. Twi-Hards are still (maddeningly) very influential. Twi-Hards drive hype and viewership. If MTV had marketed this show as the swan song of Twilight, Twi-Hards would have shown up, and they would have shown up strong. So … was this really an MTV decision? Or was the decision made for them? It’s not like the studios and the publicists don’t have input in these nominations. It’s not like these nominations aren’t tailored according to who will show up, who will activate the most Twitter hashtagging, who will get fangirls screaming the loudest. It’s not like the network doesn’t reach out then to the celebrities and the film distributors to set an agenda…together. In that spirit of cooperation then, perhaps it’s not so much about whether or not Twilight has passed, but whether or not the stars themselves are passing on Twilight. Stewart and Pattinson are clearly ready to move beyond Bella and Edward. They also, after last year’s personal drama, are obviously not keen on putting their relationship under any more scrutiny, especially now that the illusion of their romantic perfection has been shattered. Have they had enough of this? Won’t they blow us one last kiss? Sing it, P!nk. Sing it so they can hear. #RobstenIsUnbroken’s new mission is to lobby for one final snog. A final kiss goodbye. PLEASSSSSSSSSSSSSSSSSSSE KSTEW & ROB! DO IT FOR THE FANS!!!!!!!!!!!!!! 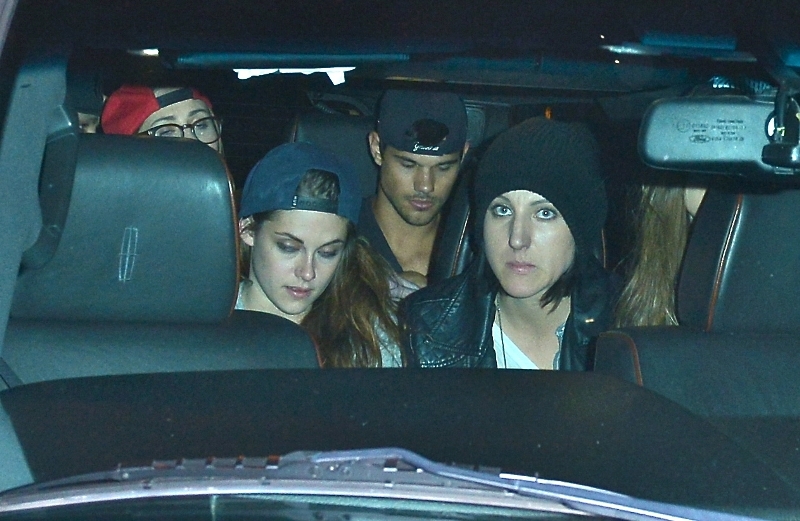 Here’s Kristen Stewart out last night with friends at the Marcus Foster show. Foster is a friend of Pattinson. Taylor Lautner was also there, supposedly drinking big boy beer out of a bottle. Click here for the full list of MTV Movie Award nominations.